Comfortable to wear and easy to use—see how ADHEAR can revolutionise your hearing, and your lifestyle. The ADHEAR revolution is here. ADHEAR uses the latest generation of bone conduction technology to give you great hearing, with no surgery required. Simply stick the ADHEAR adapter behind your ear, click on the audio processor, and start hearing instantly. What’s more, ADHEAR is the only non-implanted bone conduction device that doesn’t put pressure on your skin. ADHEAR is so comfortable to wear, you won’t want to take it off at the end of the day. Hear what ADHEAR users have to say about their experiences with this innovative bone conduction device. “I want to keep my life simple. And my hearing as well." ADHEAR is designed for people with conductive hearing loss. With this type of hearing loss, the outer or middle ear is damaged, which stops sounds from reaching the inner ear. But ADHEAR lets you hear without using your outer and middle ears. Instead, ADHEAR gently vibrates the bone behind your ear to send sound directly to your inner ear, giving you natural sound quality. In addition, ADHEAR can also be used as a solution for single-sided deafness, to send sound from your non-hearing side round to your “good side”. Each ADHEAR system has two parts: the adhesive adapter and the audio processor. 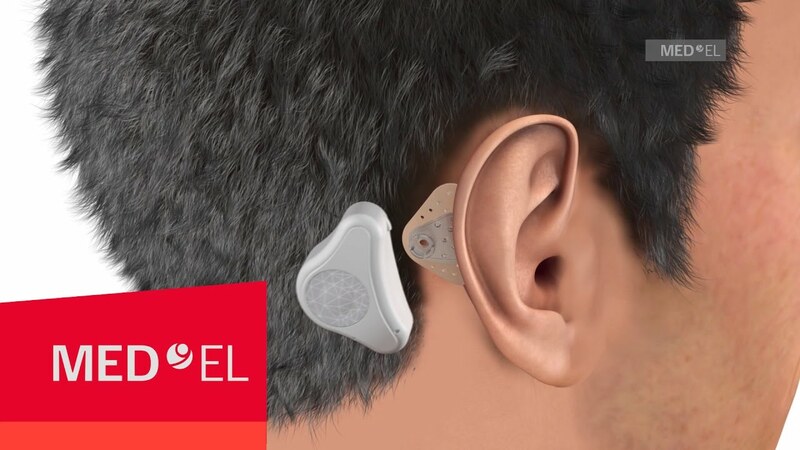 The thin adhesive adapter sticks to the skin just behind your ear, where you don’t have any hair. The audio processor clicks onto this adapter. Its microphones pick up the sounds around you, and then it vibrates the adapter to send these sounds to your inner ear. Both parts of ADHEAR are discreet to wear, and can be easily hidden under your hair. Learn more about how ADHEAR works by watching this simple video. Unlike some bone conduction devices, you don’t need any surgery before using ADHEAR. You can simply stick on ADHEAR and start hearing immediately. This also means that you can try out ADHEAR, and be sure it is the right hearing device for you before making a long-term commitment. Get in touch today with a hearing professional in your area, and try out ADHEAR for yourself. ADHEAR uses the latest bone conduction technology to bring you the best hearing possible. It works the same way as other passive bone conduction devices, but without putting any pressure on your skin. And with directional microphones, feedback cancellation, and background noise reduction, ADHEAR lets you focus in on the sounds that matter most. Don’t interrupt your hearing. ADHEAR's extensive battery life means you can enjoy great hearing for up to two weeks at a time. Changing the battery is quick and easy to do, and with only one battery to change each time, ADHEAR is cost efficient too! ADHEAR is designed to be easy. With four pre-programmed settings at the push of a button, you can hear your best in different environments. Whether you’re chatting to a friend in a busy café, or simply reading alone at home, ADHEAR tailors your hearing to the situation. In addition, you can connect ADHEAR to various accessories, to give your hearing a boost in challenging situations. From Bluetooth streamers to telecoil receivers, there’s plenty of ways to hear better on the phone, at the cinema, or while listening to your favourite music. It’s easy to hide ADHEAR discreetly under your hair. But if you want to show off your audio processor, then the eye-catching ADHEAR stickers and sleeves are the accessories for you. There are different colours and designs to choose from, so you can make your ADHEAR match your style. Customise and protect your ADHEAR with these soft and stylish sleeves. The sleeves come in three different colours, and will keep your ADHEAR free from scratches and dust. Make your ADHEAR your own, with bright and fun ADHEAR stickers. Wild zebra prints, trendy moustaches or funky pineapples—there are designs for both the young, and the young-at-heart! Make ADHEAR invisible. Both the audio processor and the adhesive adapter are available in neutral shades, so you can make ADHEAR blend in with your natural hair and skin tones.